You're starting to get the hang of doing business online. Email, blogging, Facebook, Twitter - you've figured them out now...right? I'm really pretty tech savvy and can figure out most things I run into. 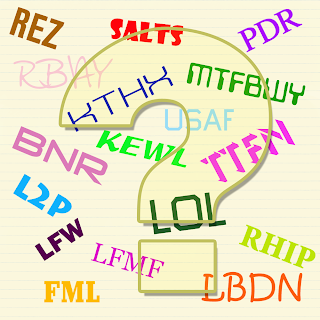 What I didn't count on was running into all these acronyms and abbreviations that are multiplying like rabbits (or zucchini) all over the Internet. With limits on our precious time and character limits on Twitter, our society has developed some sort of unique language to say as much as possible in 140 characters or less. 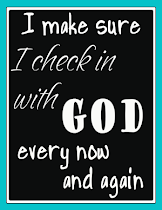 Well, hallelujah and praise the Google search! I found this site that gives meaning to the newfangled alphabet soup. 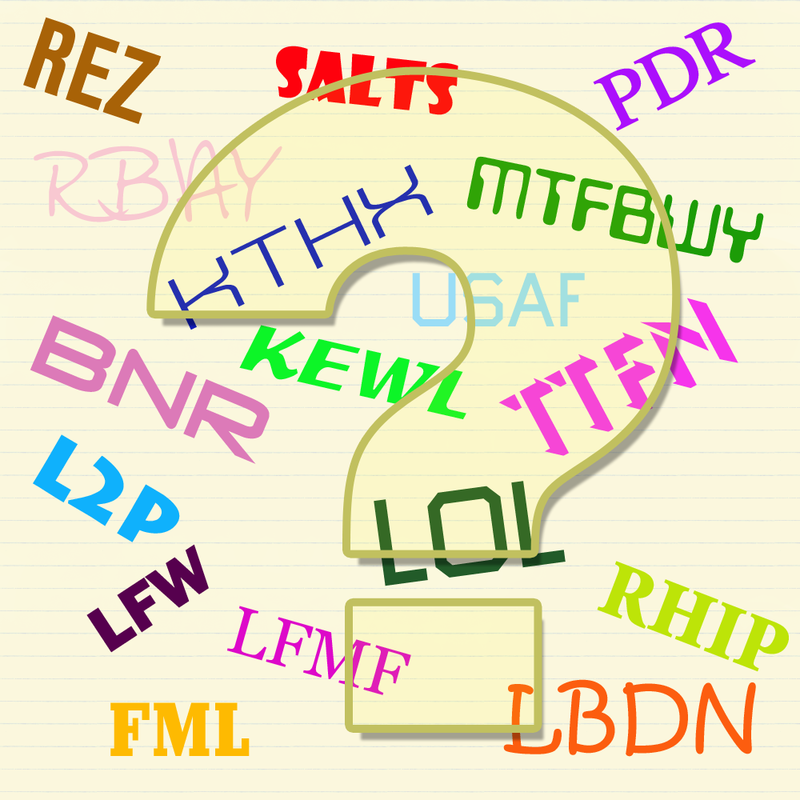 InternetSlang.com is a great resource for web acronyms, web abbreviations and netspeak. They aren't Etsy savvy, though, so don't try looking up BNR there. You'll have to trust the definitions I've posted here. Monday Madness - I need a model! This really frustrates me. We've received some recent critiques on our Etsy shop. People love our products, but feel that people won't buy them the way they are photographed. It's not new advice. I've seen it in other articles with product photography advice. Products sell better when customers can picture the items being worn or used. No matter how nice my photo looks with a lovely tatted necklace draped over a large rock or some other prop, it's not as effective as having a real person wearing it. That's too bad since I like the challenge of trying new props for my photos. My favorites so far have been my Navajo moccasins and the pewter beer stein my dad brought back from Norway. We have a body form of an upper torso that we purchased for photographing products, but the color choices were white (snow white, not Caucasian) and black. We chose black and I like how it looks in the photos, but nobody will mistake it for being a person. I realize that we need to have an attractive girl/woman to model our jewelry. It wouldn't be as tough if we made the same things over and over. Since so much of what we make is unique or one-of-a-kind, we would have to do photo shoots on a regular basis. If I were younger and slimmer, I would model them myself. My only children are boys and all of our neighbors with children have boys. I'm doomed! Are you using a real person to model your products for photos? What are the ups and downs of this? The pick of last week's party has an awesome name - Quirky Essentials. I'm always a sucker for a fun name! This shop is run by more than one person. Here is how they describe themselves: "We're just two crafty girls who like to recycle, recreate and re-love old things." What an awesome description of their work! 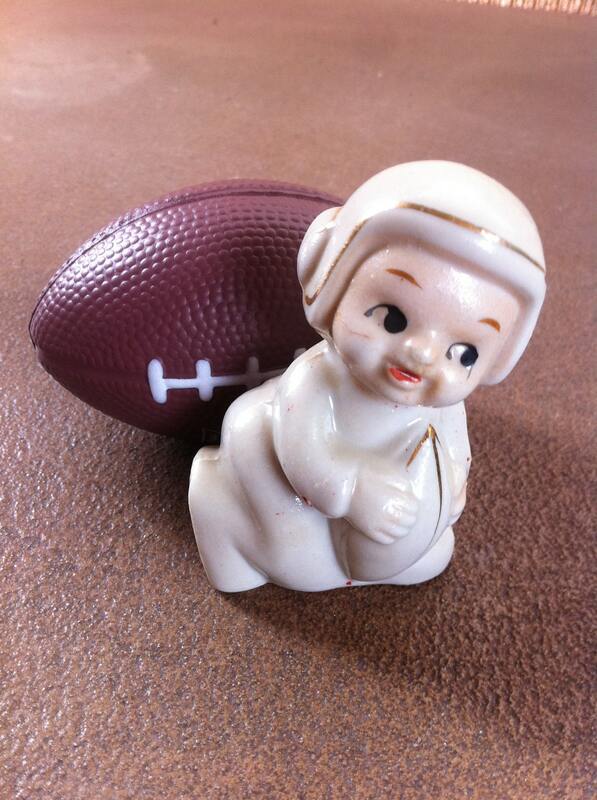 I chose to feature a vintage football figurine in honor of the NFL getting its act together (finally!). Go Broncos! What ever happened to family heirlooms? I remember a blessing/christening gown that was passed around on my mom's side of the family. Pretty much every baby in our family, boys and girls, wore the gown to be blessed or christened. I admit that I'm part of the problem. My own children didn't wear the family blessing gown. It had traveled to a different line of our family, so we went without. An elderly neighbor of mine used to tell me about the blessing gowns she made for grandchildren out of her wedding gown. Now that people seem to be more interested in traditions and vintage things, maybe the idea of having family heirlooms and keepsakes will make a comeback. Recently, my niece Evelyn was born. She is named after my mom and I thought it would be nice to give her something that could be passed along in the family. 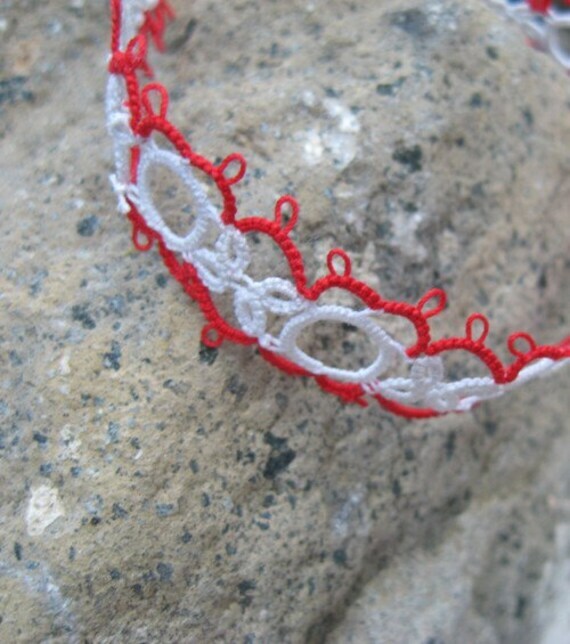 I searched through my tatting patterns and found one for baby booties. My hope is that these booties will be passed along in the family for years to come. I was happy that my sister-in-law liked them so much and they look adorable on my niece. Since I was already on a roll, I decided to tat another pair of booties for my shop. I finished them yesterday, but it took me so many hours to do that I had to put a high price on them. My friends tell me I shouldn't feel bad about charging more since it takes a lot to do all those little knots. Let's hope someone wants to start some family traditions of their own. From last week's party, I want to feature a newcomer, Bug Bites Play Food. Rebecca lives in Utah (like me) and is a wonderfully creative wife and mother. She has an arts degree, obvious from the quality of her work. 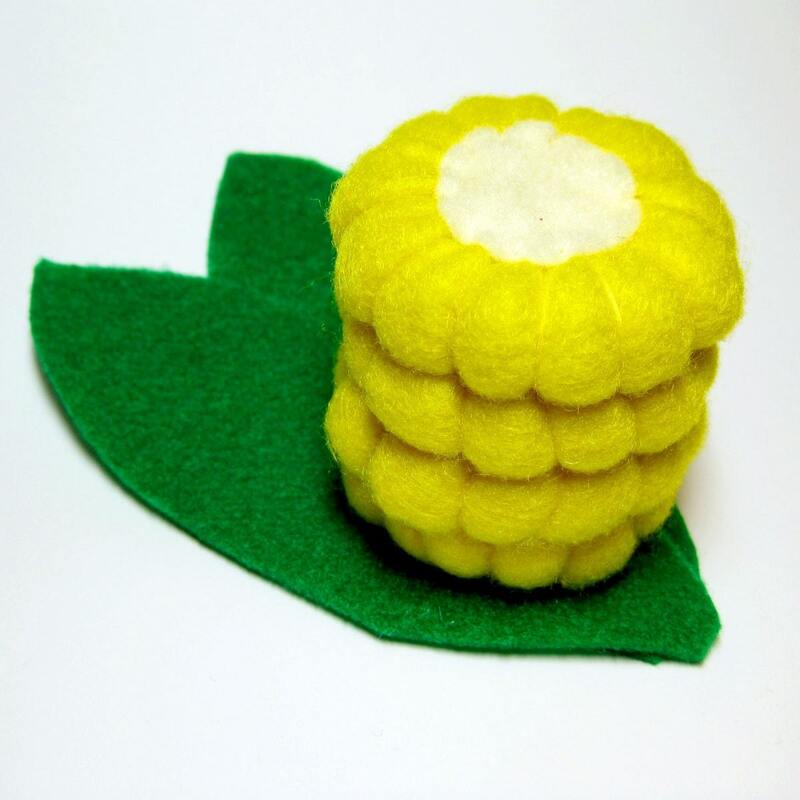 Her felt play food seems to be very popular judging from the number of sales. If you checked your Etsy shop today, you may have seen a notice about changes to Etsy's default search settings. When people do a search on Etsy, it will automatically search by relevancy rather than recency now. When Etsy did some customer research, they found that people were more likely to click on items brought up in a search of relevant items rather than those that were listed most recently. It makes perfect sense to me. Their old default of showing the newest listings seemed weird. I guess it made sense when there were fewer sellers and products and people might just want to see the latest stuff. If you decide to click on specific categories to find items you want, it will still default to the most recent listings. This is an exciting new change for Etsy sellers. 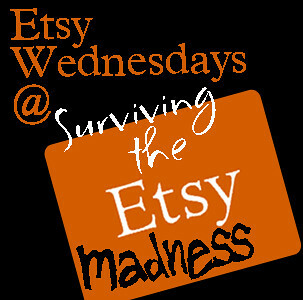 For those who have been on Etsy for awhile, it will require some changes in thinking. Relisting items repeatedly to move up higher in searches isn't necessary now. That part will save me some money! Some of the other changes to how Etsy searches work give us all a chance to shine. One of the changes Etsy mentioned was breaking up how items from the same shop show up so one seller won't dominate the search results. I tried testing this tonight by searching "tatted necklace" since I had just added a new one to my shop. Unfortunately, one shop had probably 8 out of the first 10 listings for tatted necklaces even though there are hundreds on Etsy from quite a few different sellers. I guess Etsy has some fine tuning that still needs to be done. The change I like in the searches is that when you do a search and it shows you the most relevant results, Etsy includes a bar across the top with four of the most recent listings for those keywords. As a seller, I'm happy that customers are being given better searches to work with. If the customer can find what they want quickly and easily, they are more likely to buy instead of going away frustrated. I found myself drawn last week to the shop Eight Cat Design. Roxanne is in Florida and has some delightfully colorful jewelry in her Etsy shop. 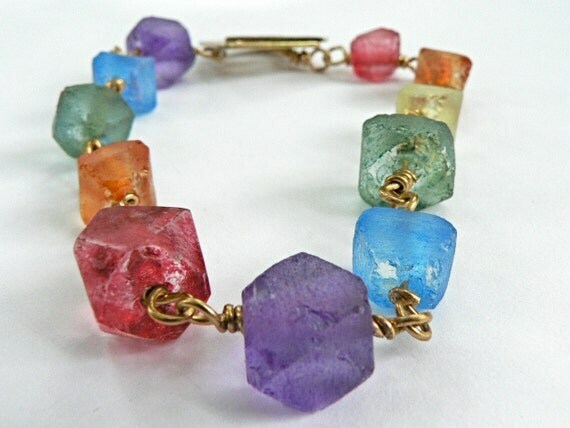 The recycled glass bracelet in rainbow colors that she linked up to last week's party was the item I fell for. 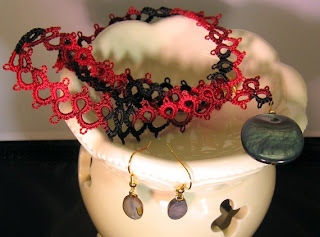 The other gem I found was in her profile where she says, " I never make jewelry unless I'm happy, so your wearable art comes with good energy - no extra charge." Sometimes I really smile when I see the changes at Etsy. It's nice to know they are trying to improve the experience for buyers and sellers. When I went to look at my Shop Stats today, I noticed they added little triangles to the line graph. The triangles indicate when you listed new products in your shop. When you mouse over the triangle, it will tell you how many new items you listed that day. For now, it only counts the new items (including when you renew any expired items). Any current products in your shop that you renew aren't counted. When listing some new shop items, I noticed a few other new options. You can choose the type of recipient (man, woman, teen boy, teen girl, baby, etc. ), the occasion (birthday, wedding, Christmas, etc. ), and the style (Gothic, steampunk, tribal, Western, etc.) of your product. These will definitely help as buyers search for things! Etsy administrators explain more in the forums and advise us to only use these descriptors when they apply. If an item is for everyone, don't select a recipient. However, if it is only for men, you can let people know. Intrigued by these changes, I wandered over to the forums to see what other changes had been made. You will definitely want to read this post about the changes to how Etsy's search function works. Improvements in the search process definitely help buyers to connect to our shops better. Nobody likes to search for a specific item and have a bunch of junk show up in the results. Etsy is continuing to work on improving how products show up in Google searches. The options they've added to the listing process will eventually drive more traffic to your shop. Okay, I admit it's kind of weird. 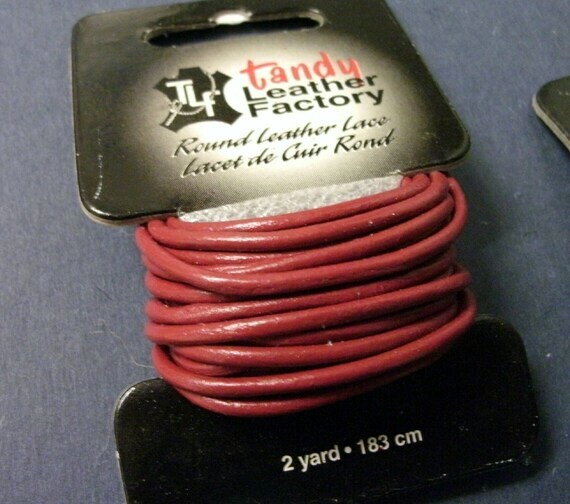 We visited the new location of Tandy Leather Factory in Orem over the weekend and I picked up a bunch of 2 yard strands of 2 mm round leather laces. Before I knew it, I was trying to tat with the leather. I didn't load it onto a shuttle (I don't have one that large!). I just used the card it was wrapped on as a makeshift shuttle. There's a certain stretchiness to the leather cord that makes the experience interesting. The picots stay overly round and it's difficult to slide the stitches very close together. Still, I like the funky/chunky look of this flower. I stacked two layers that had four petals each and then mounted it on a hair clip. The brick color looks pretty nice when clipped on my black leather purse. Some of you probably don't like the look - it certainly doesn't look like lace. I found it was a great teaching tool at this weekend's Wasatch Front Farmers Market since you could clearly see the stitches. 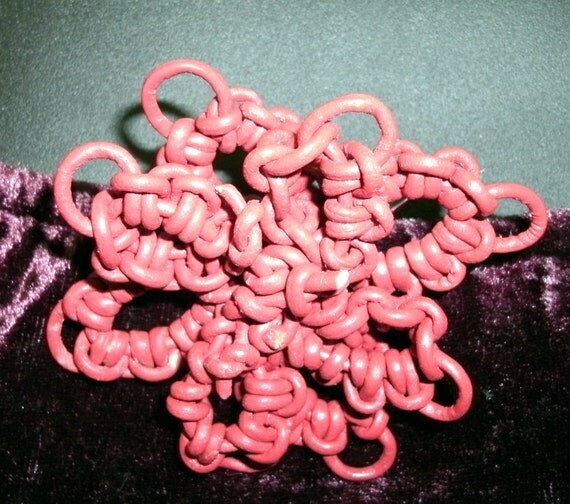 When you compare this to a bracelet tatted in size 80 thread, people are really impressed with not only the beauty of tatting, but the work involved.